The FDA issued a press release (February 6th, 2009) announcing the approval of the first biological product produced by genetically engineered animals: recombinant human antithrombin. The U.S. Food and Drug Administration today issued its first approval for a biological product produced by genetically engineered (GE) animals. The approval is for ATryn, an anticoagulant used for the prevention of blood clots in patients with a rare disease known as hereditary antithrombin (AT) deficiency. ATryn is a therapeutic protein derived from the milk of goats that have been genetically engineered by introducing a segment of DNA into their genes (called a recombinant DNA or rDNA construct) with instructions for the goat to produce human antithrombin in its milk. 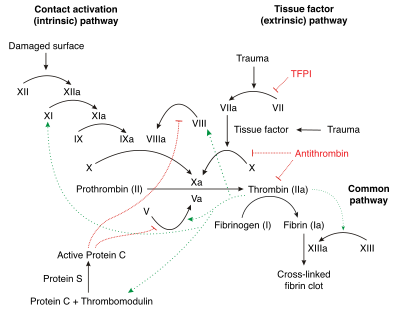 Antithrombin is a protein that naturally occurs in healthy individual and helps to keep blood from clotting in the veins and arteries. Because hereditary AT deficiency occurs in a small population (approximately 1 in 5,000 people in the United States), the FDA granted ATryn an orphan drug designation. The orphan drug designation system encourages the development of medications for patients with a rare disease or condition. Dabigatran (Pradaxa, Pradax) for the prevention of VTE. Mechanism of action, indications, contraindications, pharmacodynamics and pharmacokinetics.